I had posted about quite a few Nirsoft apps by now (and still only covered a fraction of those). But it kinda slipped me to try out and review NirLauncher – complete package of all utilities from the developer. Devastator1294 had commented about it on a really old post and it poked me to try it at last. Launcher comes bundled with near-complete (very outdated apps are skipped) set of utilities and their help files. Apps are split into groups and displayed in usual multi-column interface. Clicks (configurable) on different columns can launch app, its help file or web page. App performs core function decently. It is fully portable (itself and apps both) and comes with autorun.inf file for quick launch on external drive. Aside from native utilities launcher is extensible with additional packages. Package is defined by plain text .nlp file, example is available on site that adds Sysinternals utilities. App could use some kind of quick global search. There is generic search, but it doesn’t work between groups and packages. There is an option to show tray icon, but it provides no access to utilities, which would be staple function for launcher. Developer had mentioned that update capabilities are often requested and will be added in the future, but it was over year ago. I am not especially impressed with app’s launcher functionality, but it it is perfect way to download and drag around comprehensive set of Nirsoft utilities. 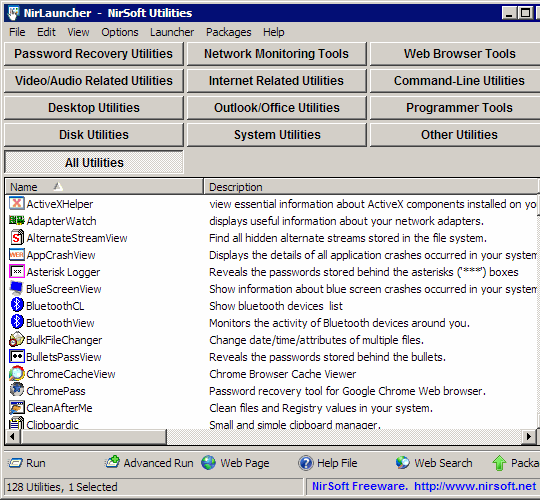 “Windows System Control Center” is a tool that incorporates Nirsoft and Sysinternals apps into one launcher. It can also work portably off an external drive. It also can check and download updates for the individual applications. No loader though…. Free for private use. give it a whirl! Thanks for suggestion (in unison on top). :) Bookmarked to check out.